Falcon was founded over 25 years ago, built on a simple formula: performance + quality. Performance means constant innovation to achieve the right actions for the job. Decades of first-hand knowledge and input from knowledgeable fishermen, from top Pros to local guides, means every rod is fine tuned for the job at hand. Quality starts with the finest components and materials in the world. On the American-made rods, Falcon starts with USA-sourced aviation-grade carbon fiber and craft the blanks in-house. This hands-on process and decades of experience gives Falcon the unique ability to fine tune actions. But quality doesn’t stop there. 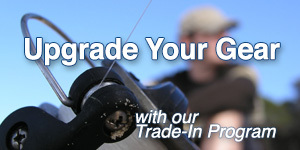 We finish each rod with the finest components available--100% Fuji guides and reel seats. Why Buy Your Falcon Gear from ALFC?